Eight division world champion Manny Pacquiao (60-7-2, 39 KOs), 40-years-old, is less than two weeks away from his next world title defense. Pacquiao is back in the world level mix after demolishing Lucas Matthysse in July 2017 to capture the WBA “regular” welterweight title. It was Pacquiao’s first stoppage win since November in 2009, when he stopped Miguel Cotto in the twelfth round. He is scheduled to defend his World Boxing Association welterweight crown on January 19 against Adrien Broner (33-3-1, 24 KOs) at the MGM Grand in Vegas, Nevada. 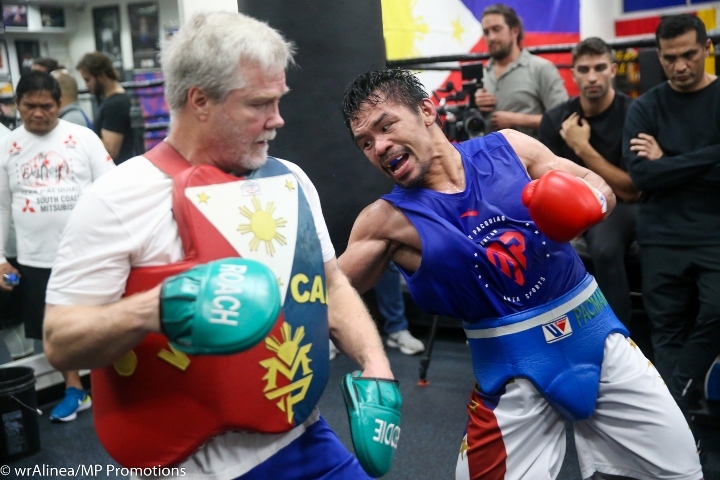 Pacquiao is training at the Wild Card Boxing Club in Hollywood, California with Hall of Fame coach Freddie Roach, trainer Buboy Fernandez, and conditioning coach Justin Fortune. At 40-years-old and eight divisional titles, Pacquiao is proud of his achievements and believes his focus brought him to this point. “It was the focus [that made me last this long in boxing], I have not thought about what I have achieved, many fighters become lazy because they think about the things they have achieved, that they are champions. But I do not think about what I’ve achieved in my career, I do not think about what I’ve done, I think about what’s coming, in the next fight,” Pacquiao explained to Eduard Cauichi. It’s expected that the Pacquiao vs. Broner winner will face Floyd Mayweather. Pacquiao lost a twelve round decision to Mayweather in 2015. He wants a rematch, but his full focus is on Mayweather. “I’m not thinking about that, my focus is Adrien Broner. It’s all about that. Maybe we can discuss [Mayweather] after this fight,” Pacquiao said. Pacquiao also did not think much of Mayweather’s recent first round destruction of Japanese kickboxer Tenshin Nasukawa. “The Mayweather fight, that was an exhibition. His opponent was a young kid with no experience,” Pacquiao said.